Amid Capitol Hill hearings, shifts in the news strategy, promoting local content, kicking out Russian spies and banning bitcoin ads, Facebook managed to beat Q4 revenue expectations, with Revenue printing st $12.97BN, above the $12.55BN estimate, however EPS missed, coming in at $1.44, below the $1.95 expected as a result of the impact of tax provision on the company, which increased by $2.27 billion. Daily active users came in at 1.40 billion, just shy of the 1.41 billion expected. Mobile ad revenue as a percentage of total was 89%; Facebook reported that Q4 ad revenue was $12.78 billion. But more than the DAU and EPS miss, this is why the stock is tumbling after hours, from Zuckerberg. In immediate reaction the stock is sharply lower, and is dragging the Nasdaq along with it. And the S&P is now on a 15-month win-streak (never happened before) and is up for 22 of the last 23 months – since The Shanghai Accord in Feb 2016!! BBC’s popular reality show Traffic Cops is not so far from what a stereotype-inclined American might imagine if told “it’s like Cops, but British.” It also shows a worrying future-that-might-be of mass surveillance in America. Traffic Cops may not be a montage of helmeted and mustachioed bobbies puffing after pickpocketing orphans on cobblestoned streets. But to American eyes, the constables of Traffic Cops do seem terribly proper and polite. Compared to the show’s ever-controversial American cousin, there’s very little shouting, wrestling, cracking of skulls, or brandishing of firearms. In fact, to Americans used to seeing copious amounts of such activities in our cop shows, Traffic Cops (and its spinoff, Motorway Cops) can seem downright boring. Sure, you get the occasional familiar chase-bail-run-tackle sequence. But thanks to strict national restrictions on engaging in high-speed chases, pursuits often end with the cops taking down a plate number and letting the fugitive drive away. This might sound like a pleasant alternative to American civil libertarians, but there’s a sinister twist that sours the picture: mass surveillance. The really boring thing about the show is how much time the constables spend just waiting for alerts from Britain’s driver surveillance network to pop up on their squad-car screens. Some background: Britain’s major roads are among the most heavily surveilled on earth. Every day, more than 8,500 Automated Number Plate Recognition (ANPR) devices placed along the country’s roads and in police vehicles read and store the location of between 25 and 35 million license plates, potentially capturing more than half of Britain’s entire population of 65 million. Driving in the United Kingdom is also regulated more heavily than in many parts of the U.S. In addition to being licensed and insured, British drivers must pay an annual per-vehicle excise tax meant to discourage private car ownership. The Ministry of Transportation is also supposed to inspect each car annually for compliance with environmental standards. The Ministry of Transporation and the United Kingdom’s tax collection service share all their vehicle data with a vast law enforcement data management system called the Police National Computer (PNC). All private car insurers are required to do this as well. And the PNC is connected, of course, to the ANPR network. As such, the ANPR cameras are able to determine, within moments, the license, insurance, tax, and inspection status of every car they see. When the system spots a violation, it alerts the Traffic Cops. Occasionally, the ANPR helps the cops recover a stolen vehicle or locate a missing person. At other times it flags cars “known to be associated with drugs,” cars possessed by people with unpaid tax debt, and cars whose owners have a history of “anti-social driving,” whatever that is. But the great majority of the infractions it uncovers seem to involve skirting the high costs of compliance with Britain’s burdensome driving regulation scheme. To judge from the show, the typical penalty seems to be a stiff fine and seizure of the car—a punishment the cops readily explain (with exquisite politeness) is imposed purely as a deterrent. What’s perhaps most unsettling about this routine is how mundane it all is. The whole process, played out time and time again onscreen, is swift, sanitary, official, and polite. There’s an insight here on how a whole nation quietly acquiesced to such snooping. Not only is it “for your safety,” it’s just really, really dull. Will America’s roads be this surveilled some day? Don’t assume it can’t happen. Forty-one states already use some form of license plate reader technology, often storing the data they collect in databases that other agencies can access. If those systems were to become a British-style integrated spying system, the results would probably look a lot like Traffic Cops. 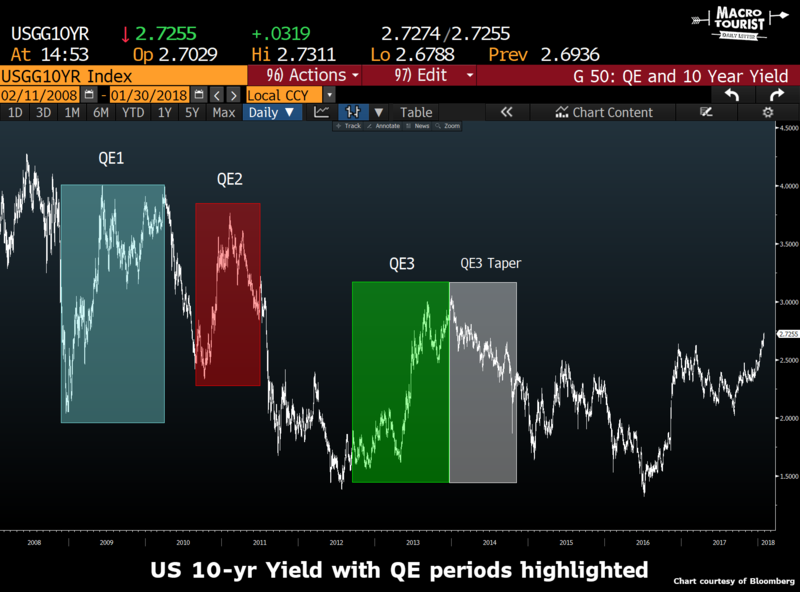 As I wrote so often, the Fed’s QT program should be pretty negative for stocks (and high yields) and be pretty positive for US Treasuries. So far, the impact has been limited. BUT, and this may sound like a completely weird statement, I claim that QT, though running for almost 4 months now, has not yet really started. That may sound strange. 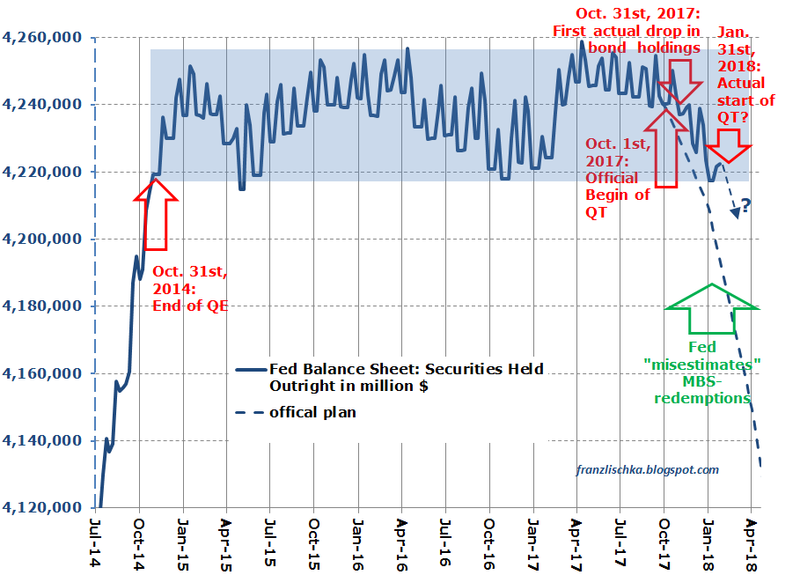 The Fed has claimed that it would reduce its balance sheets, or rather its security holdings by $10 billion/months from October and $20 billion from the start of January. So, you would expect bond holdings to be down now by almost $50 billion, which would already be somewhat significant. Well, think again. 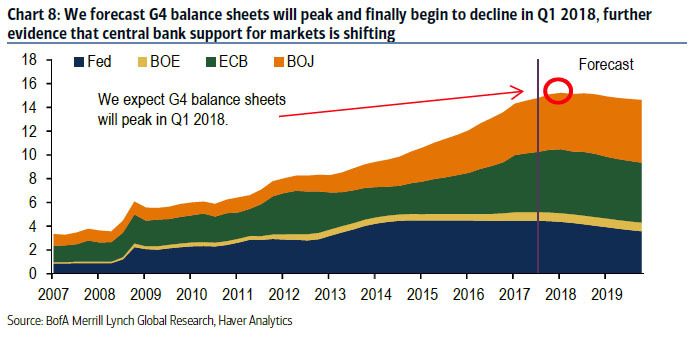 If you would look at the Fed balance sheet and you wouldn’t know that the Fed claims to reduce its size, you just wouldn’t see it. 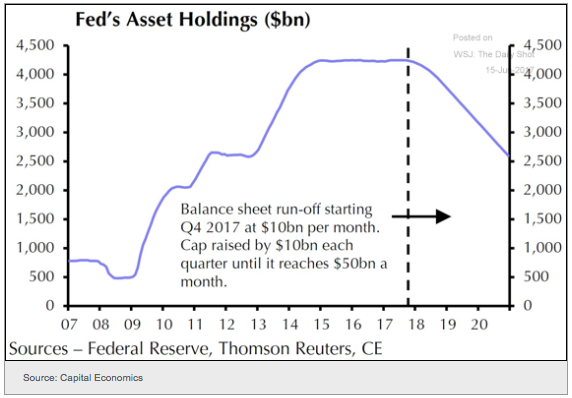 Because instead of what you would expect, security holdings since the end of September are down merely $18 billion instead of the expected $50B (the balance sheet as a whole is down by just $14 billion). Bond holdings are still higher than they were at the end of QE and within the range where they had been ever since (shaded blue area). So, all that fuzz about QT has so far been just noise. Nothing else. If it seems like it was just two days ago that Goldman was writing about a Great-er moderation, and showing a chart of macro volatility – across virtually everything, not just stocks – reaching V-fib levels, it’s because it was. A lot has happened inbetween, most notably that volatility which just on Sunday night was left for dead, has made a stunning comeback, leading to another note published overnight by Goldman which breaks dramatically with the previous one, pointing out that not only did the S&P just have two consecutive 50bp+ selloffs for the first time since 2016, but that – at a time when the VIX is at a 5 month high despite the near-all time high in the S&P – January has been, on a realized vol basis, the most volatile month since Nov-2016. Largest drawdown in months. While hardly a sustained drawdown, the past two days’ moves mark the largest selloff since August’s 2.2% dip and the first time the SPX has sold off 50 bp or more on consecutive days since 2016 (by far the longest ever between two such events). Strong VIX reaction. Monday’s move drew an outsized reaction of the VIX, with the spot VIX rising 2.8 points on the 67bp S&P 500 selloff (typically the VIX would rise just over 1 point on such a move). The VIX moved less on Tuesday’s larger S&P 500 move, but the still-large two-day 3.7 point VIX move leaves the VIX at a 5-month high. Higher SPX realized volatility, large absolute moves, and higher cross-asset volatility are consistent with a higher VIX. January will end up being the most volatile month for the S&P 500 since the 2016 presidential election. A VIX in the 14’s is reasonable given January’s 9.9% realized volatility. Furthermore, the current VIX level is on the low extreme when compared with periods when the S&P 500 has had a 7% one-month trading range. Increased volatility in rates, credit, and FX markets is also contributing to higher SPX implied vol. Goldman’s advice? The same as Morgan Stanley‘s: hedge before the drop, not after it. SPX hedges remain good value; implied vol is not high in the context of recent realized. Implied volatility remains well below its historical average and at a reasonable premium to realised vol, and the SPX has traded in a wider range recently than other underlyings with higher implied volatility. Though its implied vol has risen, China stands out from this perspective: HSCEI puts are good value. Although we see no catalyst for a near-term correction, substantial drawdowns within bull markets are not uncommon, so hedging is prudent. The increased implied vol level combined with a spot price that’s still up substantially YTD points toward collars as our preferred zero-premium alternative to buying puts and put spreads. Stocks are red. Trey Gowdy is abruptly retiring from Congress. Everybody is laughing at what looks like drool dribbling from the edge of Joe Kennedy’s mouth during his rebuttal to last night’s State of the Union. And along comes Reuters, dropping a bombshell report that, if accurate, could shift the narrative of the multiple investigations involving Russia and obstruction of justice. Reuters exclusively reported that Adam Schiff, the top Democrat on the House Intel Committee, believes the contents of the four-page memo about allegedly egregious FBI abuses of FISA could lead to the firing of Special Counsel Bob Mueller, or more likely Deputy AG Rod Rosenstein. The dollar has rolled over from kneejerk gains. Stocks have tanked (not helped by Green’s “bubble” comments). 2s30s is down over 5bps now, back below the critical 80bps level and set for its flattest close since Oct 2007. In an editorial that appeared in today’s paper, the Wall Street Journal editorial board officially called on the Trump White House to release the infamous “FISA memo” – something that conservatives have been demanding for weeks now, with little luck. It’s unsurprising that Democrats have opposed the memo’s release at every turn – accusing Republicans of distorting the truth for political ends. The hypocrisy here is glaring because, of course, Democrats have an enormous political stake in whether this memo sees the light of day, or not. But tellingly, in their criticisms, Dems have chosen to ignore the central question: Is the FBI guilty of “egregious abuses”, like the Nunes has claimed? Suddenly, it seems, progressives who went into hysterics following Snowden’s decision to expose the NSA’s shockingly pervasive – and legally dubious – domestic surveillance programs – are no longer concerned with abuses of power by federal law enforcement or intelligence agencies, and apparently no longer believe that FISA decisions should be subject to more oversight. Many also vociferously opposed the ratification of Section 702 of the FISA Act, which Congress voted to renew earlier this month. As anybody who can remember when the FBI was run by J Edgar Hoover, the agency’s history is littered with examples of these types of abuses. But progressive Democrats like Intel Committee ranking member Adam Schiff apparently have selective amnesia when it comes to abuses perpetrated by their one-time leader, former President Barack Obama. House Democrats: Please – tell us again about your commitment to social justice? The House Intelligence Committee voted Monday night to release a Republican memo that by most accounts reveals how the FBI handled, or mishandled, federal wiretap requests during the 2016 presidential campaign. The White House should now approve its public disclosure as the first of several to help the country understand what really happened. Democrats are objecting to the release, claiming partisanship and violations of national security. None of this is persuasive. Republican Intelligence Chairman Devin Nunes has followed a long and deliberative process that follows House protocol. When the FBI finally agreed after months of resisting to answer a committee subpoena for documents, Mr. Nunes deputized former prosecutor and South Carolina Rep. Trey Gowdy to investigate. The subsequent memo was vetted for security concerns, provided to the entire House committee, then made available to the entire House, then shown to the director of the FBI, and is now undergoing White House review. This is hardly a Chelsea Manning-to-WikiLeaks-to-New York Times leak. Another false claim is that Republicans are “censoring” a rival Democratic memo. The same Democrats howling about national security wanted the committee on Monday instantly to approve the public disclosure of their counter-memo that hasn’t gone through the equivalent reviews that the majority memo has. Committee Republicans voted to start that process by making the Democratic memo available to the full House, and by all means let’s see that memo too. The House memo is not about “attacking the FBI” or “our law enforcement professionals,” as Democrat Adam Schiff insists. This is about restoring confidence in a law enforcement agency that played an unprecedented role in a U.S. presidential election regarding both the Trump and Clinton campaigns. Americans deserve to know whether accusations that the Kremlin infiltrated the Trump campaign have any basis, and prosecutors and Congressional committees are investigating. The FBI might well have had cause to believe Russians were targeting the Trump campaign when they sought a Foreign Intelligence Surveillance Court warrant. But Washington also should be able to investigate if and how law enforcement agencies exceeded their remit in seeking wiretaps. The memo also concerns the integrity of the FISA process. Democrats created FISA in the 1970s to protect against wiretap abuses during the Cold War. We opposed it on grounds that it would dilute political accountability, and what do you know here we are. FISA is supposed to provide a measure of legal assurance against abuse, and FBI and Justice officials appear ex parte before the FISA judges with no competing claimants. The public should know if as part of its warrant application the FBI used the Christopher Steele dossier that we now know was financed by the Hillary Clinton campaign. The House intelligence memo may answer that question, as well as whether the FBI made other misrepresentations or omissions in its FISA application. In June 2017 former FBI director Jim Comey referred in Senate testimony to the dossier as containing “salacious and unverified” material. Is that what the FBI told the FISA court in 2016? If the FISA judges weren’t told about the partisan provenance and doubts about the veracity of the memo in the middle of a presidential election campaign, then what is FISA for? To serve as a potted plant so the FBI can get whatever warrants it wants? Are they genuine Article III judges with an independent writ or merely another arm of the executive branch that can be rolled like some deputy assistant secretary of State? The same progressives who demanded accountability for FISA courts after Edward Snowden exposed federal snooping now want President Trump to shut down the House’s limited attempt at transparency. Don’t buy it, Mr. President. Let it all out—the two House Intelligence memos, Senator Chuck Grassley’s referral letter for a criminal investigation of Mr. Steele, and all other relevant FBI or Justice documents that won’t undermine U.S. security. Our democracy can take the transparency, and after the 2016 fiasco it deserves it. The structure of the Consumer Financial Protection Bureau (CFPB) was ruled constitutional today. Unlike other independent agencies not under the direct supervision of Congress or the president, the CFPB was given a single director instead of a panel of three or five commissioners. In theory, that was meant to insulate the bureau from political influence. 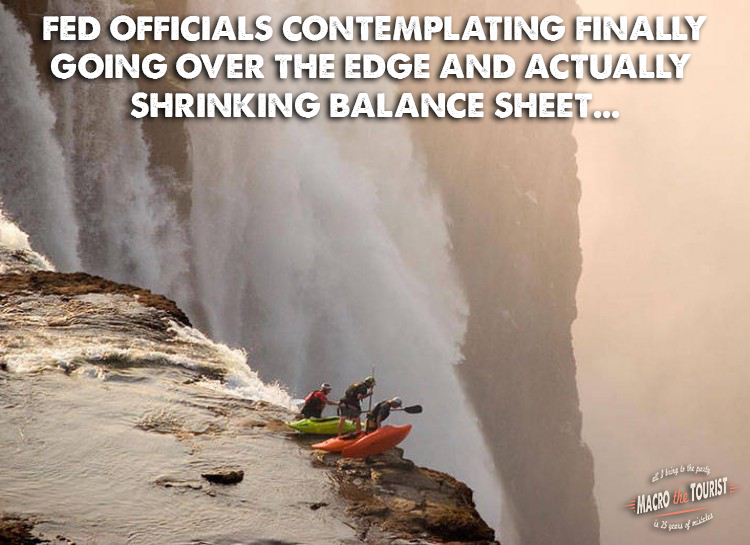 In practice, it made the director one of the most powerful people in the federal government. Last year, a three-judge panel on the D.C. Circuit Court ruled the CFPB’s structure was unconstitutional, but the bureau was allowed to continue operating while the case was appealed to the full court. The en banc panel of the court upheld the CFPB’s structure in a split decision issued today. In reversing the earlier ruling, the court accepted the argument that Congress could create a uniquely structured agency as a way to shield the bureau from political influence. “Congress’s decision to provide the CFPB director a degree of insulation reflects its permissible judgment that civil regulation of consumer financial protection should be kept one step removed from political winds and presidential will,” Judge Cornelia Pillard wrote for the majority. Although the court upheld the CFPB’s structure, it tossed out penalties that the CFPB had issued to PHH Corp., a mortgage services firm and the plaintiff in the case. This ruling might not be the last word on the CFPB. Ilya Shapiro, a senior fellow in constitutional studies at the Cato Institute, thinks the Supreme Court should take the case. The D.C. Circuit ruling was disappointing but not surprising, Shapiro says, because the court has a history of being deferential to the government’s case. The degree of control the president can exert over the CFPB remains an open question. Earlier this year, after Richard Courdray stepped down as director to run for governor of Ohio, there was a week-long legal spat over whether Donald Trump had the authority to appoint a new director to the agency or whether Courdray’s second-in-command would take over. Trump’s pick, Mick Mulvaney, prevailed in the end. As long as Mulvaney—a longtime critic of the CFPB dating back to his time in Congress—is in charge, the CFPB is likely to take a more limited view of its role as chief enforcer of the rules Congress passed after the 2008 financial collapse. Still, the constitutional question at the heart of the case will remain important for the long term. In just a few short years, the CFPB enforced regulations against mortgage brokers and powerful Wall Street banks but also used its unaccountable power to target small businesses, including payday lenders and community banks. Today’s ruling gives future heads of the CFPB license to wield that power with little restraint, says Iain Murray, vice president at the Competitive Enterprise Institute. Murray’s group has filed its own constitutional challenge against the CFPB. “This outrage to the spirit of the Constitution needs to be corrected by the Supreme Court and by Congress, which made the original mistake in giving the CFPB so much power with so little accountability,” says Murray.